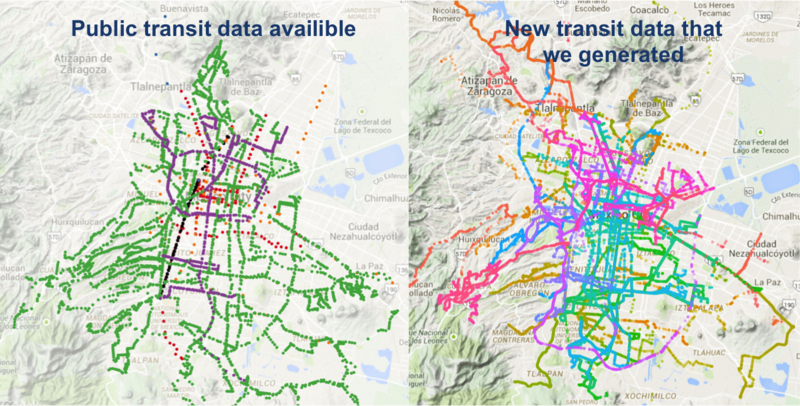 Every day 17 Million trips are done in Mexico City using public transport systems. However there is not an integrated solution to trace the routes because there is limited information. Omni is a solution to provide routing information encompassing all types of public transit available. Omni take into considerations user preferences such as travel time and cost. Our project aims to give the use the best way to move from point A to point B, using all types of public transportation, including bus, trolley, subway, taxi, bicycle and walking. However these lines represent around 20% of the real number of lines. During this time we got 200+ additional lines (most of them buses) looking for collaboration with central bus stations. We plan to get even more using gps tracking systems. It is all about User experience, we carefully designed an easy to use and friendly interface before we started coding. you get easy-to-understand instructions Omni will also remember your personal preferences, to provide you a better experience. This app can save time and money for literally millions of people in Mexico City. It can help tourist to move easily around the city. Finally, in the spirit of the open data revolution, we will provide an API so that other developers could use the aggregated data. This can benefit NGOs, researchers, journalists, and the government because better public policy can be made based on solid information. Our project has been nominated for global awards, so here is the Youtube presentation. 2) Rout Results - This one is a mockup. 4) Data - We wrangled with the data, and uploaded it to cloudant service in Bluemix. It looks like a long road in the technical and data arena but we are willing to make the effort because we believe that this may impact millions of people life by saving time and money for them. The aggregated benefit is gigantic. Mexico is one of the largest cities in the world and most of the government budget for mobility is going for car infrastructure even though 84% of daily trips are done in public transit. We dream of a platform widely used. To achieve this dream, in addition to the desktop and mobile implementations we must reach also to the users that don't have smartphone or data plans, so we think that placing digital kiosk in major subway stations could help a lot of people.